In this tutorial, we will see how to extract and analyze facebook data using R. Facebook has crossed more than 1 billion active users. Facebook has gathered the most extensive data set ever about behavior of human. In R, we can extract data from Facebook and later analyze it. Social media mining is one of the most interesting piece in data science. You can analyze sentiments of an important event by pulling information about the event from Facebook and get insights from data in R.
Go to https://developers.facebook.com and register yourself by clicking on Get Started button at the top right of page (See the snapshot below). After it would open a form for registration which you need to fill it to get yourself registered. Once you are done with registration as shown in step 1, you need to click on My Apps button (check out the snapshot below). Then select Add a New App from the drop down. Then you need to write Display Name of App ID (Type any name) and select drop down option in Category (Choose Education). press Create App ID button. In this step, we need to note down our App ID and App Secret (Refer the screenshot below). Go to R and install Rfacebook and RCurl packages. Run the following code to install them. 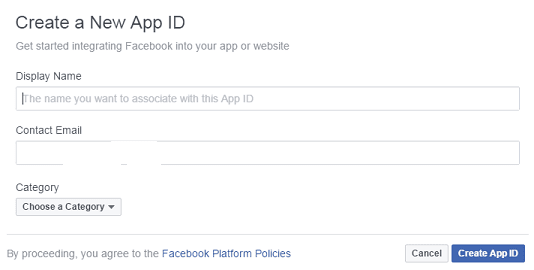 The package Rfacebook lets you to access Facebook App via R.
In this step, we will load the above installed packages. Press ENTER in R Console or CTRL+ENTER in R Studio. Are you getting the error below? Error in callAPI(query, token) : An active access token must be used to query information about the current user. Recently Facebook has made changes in the API which causes error in functions of Rfacebook package. See the method below to correct it. Now, getUsers() function will work. Suppose you want to see all the pages you have liked in the past. The sample() function is used to list some 10 random pages you have liked. "The Hindu" "ADGPI - Indian Army" "Brain Humor"
 "Jokes Corner" "The New York Times" "Oye! Extra Pen Hai?" "So You Think You Can Dance" "Shankar Tucker" "Rihanna"
You can also update status in Facebook via R.
In the above code, we are telling R to search all the pages that contain 'trump' as keyword. The n= 200 refers to the number of pages to return. "Donald J. Trump" "Ivanka Trump"
 "President Donald Trump Fan Club" "President Donald J. Trump"
 "Donald Trump Is My President" "Donald Trump For President"
See the status posted by BBC News. The facebook page name of BBC News is bbcnews. You can also put the beginning and end date of the posts you wanted to extract. 10. Which of these posts got maximum likes? To know the most popular BBCNews post, you can submit the following line of code. "Could circular runways take off? (via BBC World Hacks)"
11. Which of these posts got maximum comments? Some posts are not so popular in terms of likes but they fetch max comments. It might be because they are controversial. "When Angela Merkel met Donald J. Trump, did her reactions speak louder than words? 12. Which post was shared the most? "Islam will be the world's largest religion by 2070, new research suggests." In terms of marketing or growth of a website, it is very important to know about the users who liked a certain post. To know what users think about a post, it is important to analyze their comments. 15. What is the comment that got the most likes? 16. What are the most common first names in the user list? Facebook has more than a like button. Last year, it launched emoji (emoticons). If a post got 1k likes, it does not mean everyone really loves the comment. The reaction can be happy, sad or angry. First, searchGroup() function searches id of a group from which you want to pull out posts. Later, the group ID is used as a input value in getGroup() function. In case, searchGroup() function could not find group id. You can search it on lookup-id website. Text Mining (Social) has gained a lot of interest in a last couple of years. Every company has started analyzing customers' opinion about their products and what customers talk about the company in social media world. It helps marketing team to define marketing strategies and development team to modify the upcoming products based on customer feedback. 79 Responses to "Facebook Data Mining using R"
I have added a method in the post to fix this error. Yes, you need to run both the steps - Step 1 and Step 2. Run one by one. Make sure you change app_id and app_secret number before running step2 code. any fix for this pls????? Added the fix. Hope it helps! @Deepanshu....thank you for the original post and then for the fix as well. Will test it out and let you know. Looking forward to more learning. Thanks again. I just run the fix. It works. awesome . thanks a ton! It's a warning. It returns information about public pages that match the keyword. It seems to be some issues with handling missing data in this function. Thanks very much for the fix you've published! Any method for deriving a list of users who have liked a particular facebook page? we get only name and id how can we get emails ? I am trying to scrape a list of facebook posts, NOT FROM A PARTICULAR GROUP, and extract basic information like SHares, Likes and date of activity. It seems that the Rfacebook packages may be limited is that correct? I am curious to know how you resolved this! This all happen when you turn on this feature, go to your account setting-->account security--> mark check on log in approvals. "Can't load URL: The domain of this URL isn't included in the app's domains. To be able to load this URL, add all domains and sub-domains of your app to the App Domains field in your app settings"
Just a quick question, may I do status update for a particular FB page? If yes, let me know how is it possible. thanks. Facebook has imposed the use of the https:// instead http://. So http://localhost:1410 can't work and gives error. Bad Request (HTTP 400). Failed to get an access token. What did I wrong? I am newbie in web - scrapping so would you please enlighten me? Is it possible to know the post to which a particular Facebook id reacts?? If you want to get famous and promote your business then you need to enhance your Profile visibility on Instagram by gaining your followers, likes, and comments from Hubsoon.com. "http://localhost redirects are automatically allowed while in development mode only and do not need to be added here." Emails and passwords are huge way to protect your social account. The key here is to use as many different passwords as possible and try not to use the same one twice. All people just use Free Random Password Generator for saving their personal accounts. It is a very good idea to secure accounts.